How Much Mud Per Sheet of Drywall? How Do I Factor in Labor Cost for a Basement Wiring Job? Finishing out a new room or remodeling an existing one requires accurate estimating, especially if you’re on a tight budget. Walls and ceilings are drywalled. Drywall is a relatively inexpensive construction material, but only if you install it yourself. In addition to the drywall panels, you’ll need taping materials and specific tools to install and finish out the four walls and the ceiling. 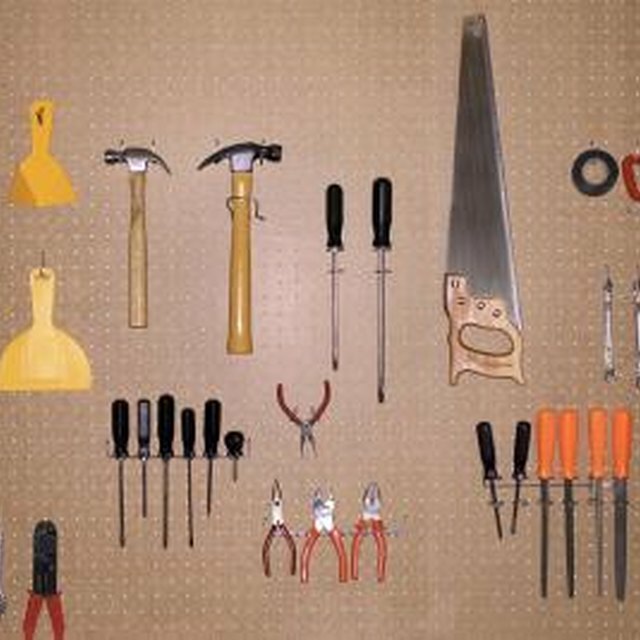 Estimate the materials, supplies and tools when you're figuring your construction costs. You’ll need eight 4-by-12 drywall panels for the four walls and three panels of the same size for the ceiling. While construction materials fluctuate, sometimes from one day to the next, as of October 2011, a 1/2-inch thick panel cost about $1050, so expect to spend about $115 for the panels. With panels this size you can install two panels horizontally per wall and three panels on the ceiling. One box of drywall screws, at about $20, is sufficient for hanging all the panels. An all-purpose pre-mixed joint compound is required for filling the seams between the drywall panels and for covering screw indentations. A 5-gallon bucket costs about $13. One bucket is enough to tape the entire room. A 500-foot roll of drywall tape will set you back another $10. Buying the tools needed to hang the drywall and tape it out can take a chunk out of your wallet. Fortunately, most or all of the tools can be rented for a fraction of the price. The most expensive tool you will need is a drywall hoist, which you will use to raise and hold the 12-foot panels against the ceiling joists while you insert the screws. Hoists start around $300 and go up, depending on the amount of weight the hoist can hold. To install the three ceiling panels, you’ll only need the hoist for a couple of hours, and a single-day rental fee will vary from $35 to $60. Renting a drywall screw gun and taping tools will add another $20 to $35. You’ll have to keep the taping tools a few days, because the taping process requires multiple applications. Hiring a drywall contractor to install and finish out the room will increase the cost substantially, but it will also save you a lot of labor, and you’ll get smooth, professional walls. Contractor’s fees vary, but expect to pay $40 to $70 per sheet for installation and taping, or $440 to $770 for your 12-by-12 room. Additional fees may apply if the contractor has to drive a distance to reach your home. Glenda Taylor is a contractor and a full-time writer specializing in construction writing. She also enjoys writing business and finance, food and drink and pet-related articles. Her education includes marketing and a bachelor's degree in journalism from the University of Kansas. Why Are Joists Visible Through a Smooth Ceiling?